I always like to give my kitchen a few farewells as the hot weather approaches and one of those “farewells” is a last oven turn-on. 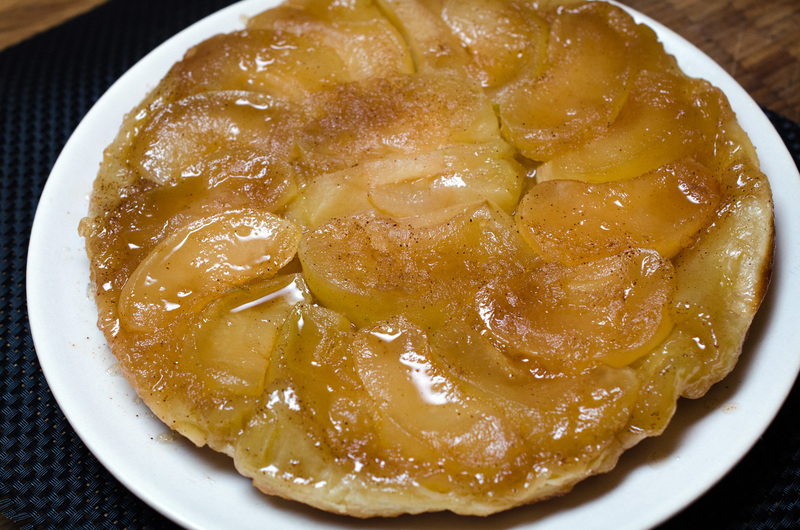 So, what better way to say adieu than with a tarte tatin, that quintessentially French winter dessert. I don’t know why more home cooks don’t make these beautiful and very tasty tarts as making one is easier than making a pie or cake, particularly since it nicely uses frozen puff pastry. When I made the one in the photo I cut my apples into eighths instead of quarters – don’t know what I was thinking. Quarters just seem to look better when you turn the tart upside down. Anyway, here’s how you bring a little bit of France to your dessert table. I use a nonstick, oven-proof frying pan and recommend that you do, also. Combine the sugar and water in an 8-inch nonstick, oven-proof frying pan over low heat. Cook, stirring constantly, for about 4 minutes or until the sugar has dissolved. Raise the heat to medium and bring to a boil. Allow to cook, without stirring, at a gentle boil for about 8 minutes or until a golden syrup has formed. Stir in the butter and cook, stirring, until well-blended. Remove the pan from the heat and carefully arrange the apples, cut side facing up, in a slightly overlapping circle down into the caramel. Roll the pastry out on a lightly floured surface and then cut it into a circle about 9-inches in diameter. Place the pastry over the apples and fold the excess edge under to enclose the apples. Using a paring knife, cut at least 4 slits in the center of the pastry to allow steam to escape. Place in the preheated oven and bake for about 35 minutes or until the pastry has puffed and is golden brown. Remove from the oven and place on a wire rack to set for about 5 minutes. 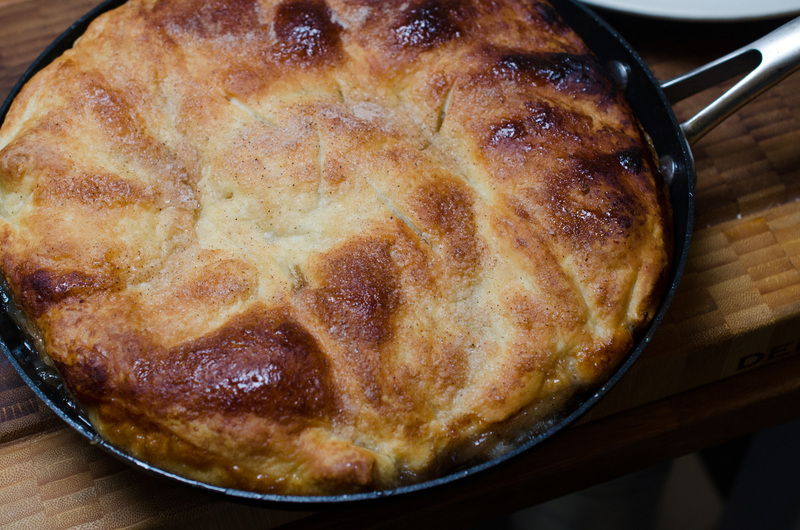 Using a small, sharp knife, loosen the edges from the pan and then carefully turn the tart out onto a serving plate. Serve warm with whipped cream, crème fraîche, frozen vanilla or coffee yogurt, or caramel ice cream, if desired. It is absolutely fine on its own, also.